Picture windows provide an unobstructed exterior view and are thus often used to showcase the landscape. They are more energy efficient than other types of windows due to their airtight seal and to the fact that they allow more natural light into the room. The average DIY cost to install or replace a 48"x 48" vinyl picture window is $450. 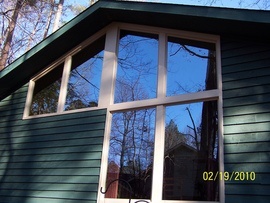 Wood picture windows of the same size run approximately $880. Labor costs are approximately $38 an hour for replacement and $30 an hour for removal.